The coming-of-age film is one of the most enduring and beloved film genres in cinema. Finding an original perspective on these well-worn issues can be a struggle for filmmakers. But as the lives of teens change with society and technology, films have an opportunity to evolve as well as provide a new take that speaks to the next generation. Screenwriter Marilyn Fu and actress Meghan Rienks (who shares story credit) saw that need to provide a modern take, and developed the new film, The Honor List. Focusing on the immediate aftermath of title character Honor (Arden Cho), her three lifelong friends (Rienks, Karrueche Tran, and Sasha Tierterse) attempt to live out her three wishes, including take revenge on the school bullies. Australian director Elissa Down (The Black Balloon) brings a slightly outsider view on this story of a very American high school experience, a subject we discuss in our recent interview about her American film debut. Lesley Coffin: How did this screenplay come to your attention? Lesley Coffin: Do you remember anything about that pitch that might have helped you land the film? Elissa Down: The thing that I pitched was I wanted to make a rites-of-passage movie. I didn’t want to make a teen comedy or something like that. Being from Australia, I’m used to seeing teenagers depicted in a certain way, a very unrealistic way. And having met a lot of American exchange students they confirmed those feelings. I wanted to ground the film in a sense of realism and focus on how these girls learn and grow, throughout the film. And I wanted to make certain we kept that humor and emotion that was already in the script. Lesley Coffin: Did you feel this screenplay was unique to being American and something which couldn’t be translated to Australia? Elissa Down: What was really interesting were things like cheerleading. We don’t have that in Australia so my only understanding of that world comes from American pop culture. But that what was really exciting about the project for me. It was a different world, but something I could give an outsider perspective on. I maybe saw the clichés that people outside that world question. But having been a teenage girl myself, I could still see these types of girls at my high school, they just weren’t cheerleaders. Lesley Coffin: How closely did you work with Marilyn Hu before beginning production? Elissa Down: I adored working with Marilyn. She’s such a talented writer. And being a director who’s written some of her own projects I hope can be an asset to a writer, because I understand their struggles. You can build a relationship, and we only had two weeks together to polish the script to get it greenlit. And I think we worked really well together. I think she saw that I was interested in shaping the script with the idea of how we’d film it and get it made, and I really appreciated how unique her voice is. And we shared a lot of similar life experiences growing up, as did Meghan, that could provide inspiration. Lesley Coffin: Could you explain a little bit about how involved Meghan was in the writing process? Elissa Down: Meghan’s agents suggested she write something for herself, because she was at that frustrating point when things weren’t happening the way she wanted them to. She wasn’t getting the interesting roles she wanted, so she needed to create one for herself. And she had a friend who wrote out this bucket list with her and they did one of the items on the list. She and Marilyn have the same rep so they were matched up, and Meghan pitched the story to Marilyn who began working on the first drafts. But Meghan’s fantastic because she was never so precious with the story. She encouraged everyone to have input. Lesley Coffin: What was the casting process like regarding the finding of the other main characters? Elissa Down: Meghan was of course attached and I watched her work on Freakish and thought she was terrific. I have a background in acting and have worked with all different types. I’ve worked with first-timers, newcomers, and veterans and legends. On The Black Balloon, I had Gemma [Ward] who was in her first role, I had Reese who had been on a soap, and I had Toni Collette who’s one of Australian’s greatest actresses. So, I love the challenge of working with actors, and I love casting actors. I love watching their previous work and even watching some of their press, and seeing what their potential is. I find that casting process to be very exciting. And then my role as a director is to bring out of them that potential I saw in them. Lesley Coffin: Do you build a film’s aesthetic around the performances and casting or do you do all that work during pre-production? Elissa Down: For me, it’s always performance first because if you don’t have performance, you don’t have a story. Sometimes the visual will help set up the story or aid a performance. And while the right hand should always be helping the left, you need to use both together. 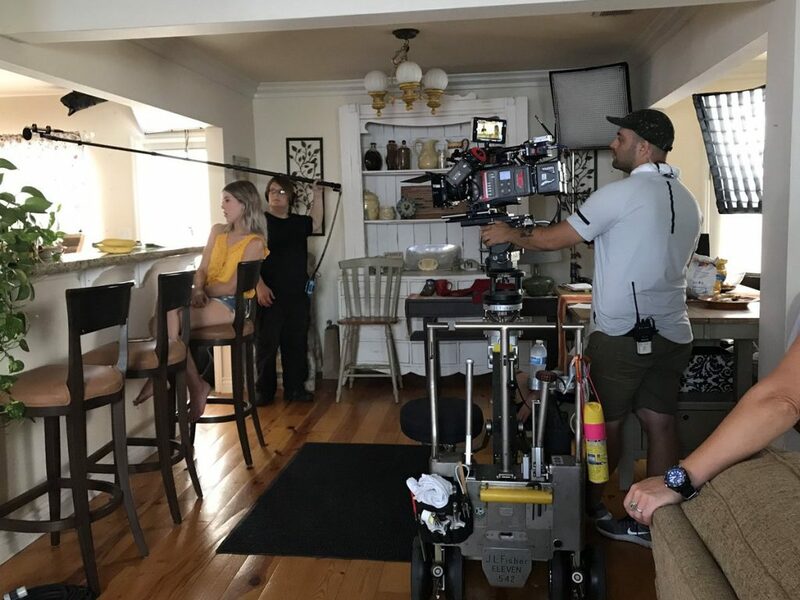 But that comes into having good prep work and a good relationship with your [Director of Photography], so when you’re onset you can quickly say what you need or what you’re looking for, but focus on the scene. Once we’re filming, I don’t like to start and stop to make sure a scene’s lighting’s right or adjust a shot. Because that can hurt a performance. I hate when you call cut and every member of crew runs in to make an adjustment to the scene, because it can throw the performer off. Lesley Coffin: I noticed all the flashback scenes have a pinkish color. What inspired that visual touch? Elissa Down: When you see some of my short films, you’ll notice that I like a pink jam. I’m very inspired by female street art. So I thought it would be nice to put that there. And not to sound cliché but when someone dies you often will see them through rose colored glasses, and I wanted those scenes to look very different from the rest of the film, to make it clear that the characters are looking back at an earlier time. We also put a 16mm grain on those scenes, because I think subconsciously, when people see grain, they think of the past. Lesley Coffin: The Saldana sister’s executive produced the film. What was their involvement? Elissa Down: After I pitched at Lionsgate, then I had a meeting with Marilyn and Meghan, and then I meeting with Mariel and Cisely. I didn’t meet Zoe until we were on set, and even then by Facetime. But Zoe was so wonderful because she would write letters when we were trying to cast. She would write and ask certain actresses to come in, which was helpful for us to get past some of the agents, she gave the film some notice. And Mariel and Cecily would come by set regularly and give notes typical of executive producers. Lesley Coffin: I understand a majority of the crew was female. Was that coincidence or something you actively pursued? Elissa Down: We wanted to work with women and 60 percent of the crew were women. And we felt strongly that the film should have gender parity. I wanted a crew which could reflect their experiences on the film. I did think it was very important to have a female DP, because when you look at photography there’s a dramatic difference between the way the male lens photographs teenage girls and the way the female lens will. There’s always this sexual gaze to the male gaze where the female gaze will show girls how they like to be presented. And I thought that was very important to have female production designer, who could bring her memories of being a teenager to the design of their bedrooms. The stuff in Isabella’s room is taken directly from the room our production designer had in her room. She used some of her own artwork.